I’ve been pondering a word that could describe today. It’s a very hard day to sum up in one word. In fact, this entire week has been something of a unique one. From a space point of view, it’s been busy, largely due to the endless supply of space science research spewing from the American Astronomical Society’s Division of Planetary Sciences meeting in Puerto Rico. However, last night (and early this morning) is what topped it all off. The NASA LCROSS mission slammed into the lunar south pole at 4:31am (PDT) and I was there tweeting away, keeping abreast of all the juicy LCROSS news. That was until Time Warner Cable decided to pull the plug on my internet connection 10 minutes before the main event (I’m certain they did it deliberately, it’s the only explanation). Panic-stricken — and really peeved that I’d spent the whole night excited to see the glorious end to this Moon mission, only to be foiled by my ISP — I checked the TV, and it was working, plus a local channel was covering the event. Phew. As it turned out, there wasn’t much to see. Oh well. Anyway, on waking up this morning, I was shocked to find my inbox was stuffed full of Twitter follow messages and notes of congratulations from my team at Discovery News. CNN had picked me, with four heavy-hitters on Twitter as their #FollowFriday. But it wasn’t an ordinary #FollowFriday, the guys at CNN Technology posted this #FollowFriday on their site! So despite my internet woes, CNN had chosen me (@astroengine) with @BadAstronomer, @Astro_Mike, @LCROSS_NASA and @NASA_AMES. So I was in the company of an entire NASA facility (Ames), a NASA mission that had just hours before slammed into the Moon (LCROSS), the first astronaut to tweet from space (Mike Massimino) and the one, and only, Phil “The Bad Astronomer” Plait. So, I’d like to take this opportunity to say “hello” to my hundreds of new followers! The biggest factor hanging over human settlement of other worlds is the question of water. We need it to drink, we need it to cultivate food, we need it for fuel (indeed, we need it for the first lunar microbrewery); pretty much every human activity requires water. Supplies of water could be ferried from Earth to the Moon, but that would be prohibitively expensive and ultimately futile. For us to live on the Moon or further afield, H2O needs to already be there. Ever since the Apollo lunar landings when samples of rock were transported to Earth we’ve been searching for the mere hint of this life-giving molecule. There have been indications that the lunar regolith may indeed contain trace amounts of the stuff, but on the whole, scientific endeavour has yet to return evidence of any large supply of water that could sustain a colony. Up until now, scientists haven’t been able to seriously entertain the thought of water on or near the surface of the Moon, apart from in the depths of the darkest impact craters. 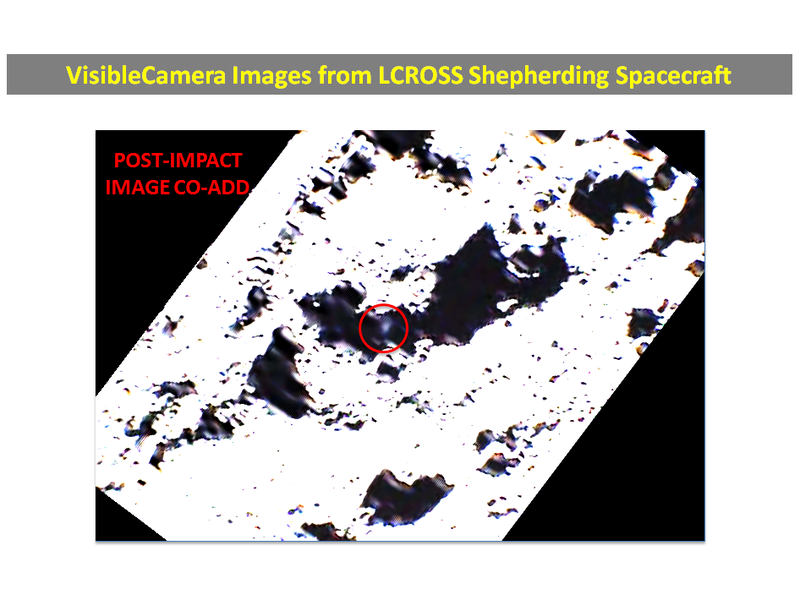 However, data from the recently deceased Indian Chandrayaan-1 mission has supported data taken by the Cassini probe (when it flew past the Moon in 1999 on its way to Saturn) and NASA’s Deep Impact probe (which made several infrared observations of the lunar surface during Earth-Moon flybys on its way to the 2010 rendezvous with Comet 103P/Hartley 2). Both Cassini and Deep Impact found the signature of water and hydroxyl, and now, a NASA instrument on board Chandrayaan-1 reinforces these earlier findings. The NASA-built Moon Mineralogy Mapper (M3) on board the Indian satellite detected wavelengths of light reflected off the surface that indicated hydrogen and oxygen molecules. This is convincing evidence that water is either at, or near, the lunar surface. As with the previous measurements, the water signal gets stronger nearer the lunar poles. So what does this mean for the future of manned space exploration? Although water has been detected, this doesn’t mean there are huge icy lakes for us to pitch a Moon base and pump out the water. In actuality, the signal indicates water, but there is less water than what is found in the sand of the Earth’s deserts (you can pack away the drinking straws now). If there are widespread water deposits (despite the low concentrations), even in regions constantly bathed in sunlight, there is huge potential for water deposits in those mysterious, frozen craters. Interestingly, these measurements indicate that the water may not have just been deposited there by comets; the interaction between the solar wind and the existing lunar mineralogy could be a mechanism by which lunar ice is constantly being formed. “Every place on the moon, at some point during the lunar day, though not necessarily at all times, has water and OH [hydroxyl],” Sunshine said. Next up is NASA’s LCROSS mission that is scheduled to impact a crater in the south pole on October 9th. Analysis from the impact plume will supplement this positive Chandrayaan-1 result, hopefully revealing yet more water in this frozen region.